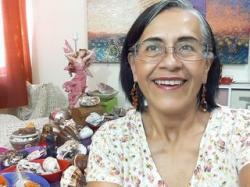 CRYSTALFAIRY - Natural Healing, Love Ritual, Mind And Body in Bolivia. I love music! I am a children's orchestra conductor and my hobby is to make manualties as embroidery and crochetting. I like to read about science, good novels and personal growth subjects. I love to participate in Holistic Fairs. I was born in Mexico. I can access your ancestral memory! Radiance meditations in pvt for harmonizing your chakras. I sense auras and check on your cycles and rhythms in life. If I am allowed by Spirit, messages from your loved ones that had passed away will come to me. Shells, stones and crystals, symbols and tarot cards as my tools . I help you to discover what your ancestors inherited to you! People that are rude and not aware of the pain of others and animals. 17 years of experience in Bolivia.